Note 1: Mitch Duke made his debut for the Wanderers in this match, coming on as a substitute in the 69th minute, and immediately scoring his first goal for the club as he scored a header from a corner kick. Does risdon come straight back in I wonder maybe Tate will be used in GF? Riera was horrible, I was at the game and he was so lazy and played horribly. 4-0 up in the first half, giant thunderstorm in the 44th minute, game abandoned. FFA decide to just give both teams a draw. Run out song for tomorrow. To the same tune, just a change to a few of the verse's. HAMILL, ELRICH AND LLORENTE MOVE LIKE STATUES IN A ROOM. I'd place a bet on your prediction but it's only paying $1.25 at best. Odds for final 3 - 3 score or Vedran ******* up? Is there any difference in price between buying a ticket to the game online and buying at the ground? If you get there before 5.30 it's free. The jets and a bit so so this year so we are bound to play them into form. 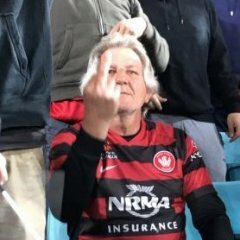 O'Donovan hat trick in first half and he gets sent off in the second and we loose 3-0 after Vedran comes up for a corner in the 93rd minute and scores to redeem himself, jumps into the RBB a la Bullet and is called for offside by the VAR when clearly on side. Thanks for that, I'll be leaving later though. If your a Telstra customer, you can get $20 ga tickets. I would rather see the NYL team lineup with Suman, Russell, Mourdoukoutis, Grozos, Tockich, Cordier and try to win that. O'Donavan to score a hatrick against the first team I don't think we will take the lead in this one. Hoping NYL is on foxtel or streaming would rather the boys won that if were to take something from the season. bring on more disappointment tonight, it's Game Day *****!! !